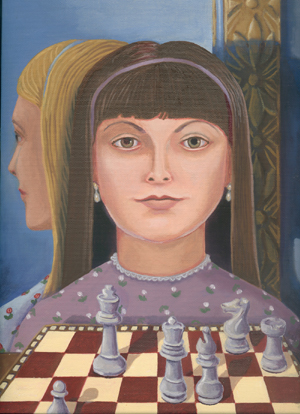 "The Chess Set (Portrait of Alice Liddell)," © 2003, oil on linen, 12x9 in. Portrait of the "real" Alice, for whom the beloved books were written by Lewis Carroll. Reflected in the looking glass is the storybook Alice. Alice Liddell, with her penetrating, intelligent gaze, was photographed as a child by Carroll and as an adult by Julia Margaret Cameron. My portrait is a composite of these photos, showing a timeless Alice, neither child nor adult.